Our first seasonal limited release! Rich, sumptuous roasted malt flavours, broadened with the sweet, silky finish from plenty of oats in the mash. 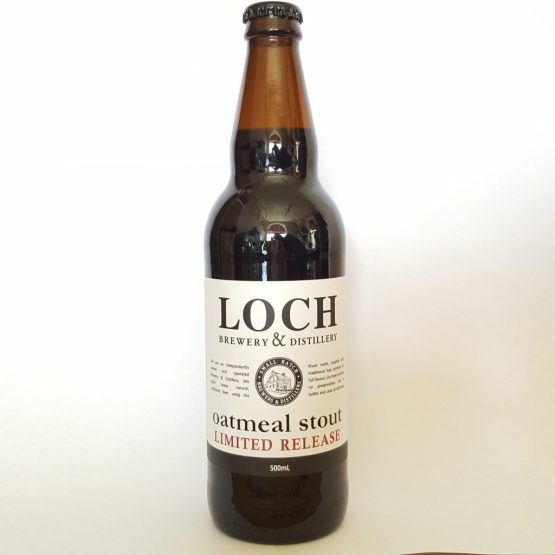 A strong stout for those cold Winter days. Available exclusively for pick-up from the Cellar Door from September 2016 for a limited time! Our first seasonal limited release! Black in colour from plenty of chocolate and roasted malts, with light bitterness to balance the robust flavours & the addition of oats for a sweeter, silky finish. 750ml | 14.2% alc/vol Our 2017 boilermaker stout is the first to be cask-aged. A very limited rare release! A blend of the 2017 Loch Brewery Oatmeal Stout with Dark Ale new-make malt spirit, straight from our whisky still. This boilermaker blend was aged for over eight months in a two-hundred litre ex-bourbon cask. Best served in a large glass at 14 degrees Celsius, minimum.